Kebab - a dish that is perfect for cooking outdoors any time of year. Recipes marinade for barbecue there is a huge number. With the advent of new spices and products on the shelves of shops lovers of kebabs to invent new ways to cook flavorful meat. One of the new options of cooking marinade sauce - mayonnaise with lemon juice. Pork is the most common form of meat, which is most often used for barbecue. This is due primarily to its original tenderness. However, the taste and toughness of meat cooked on an open fire is affected by so many factors. First and foremost is the marinade. The opinions of the lovers of kebabs in this thread disagree. Some people prefer to marinate the meat in its own juice, the other is used as a marinade, a mixture of different. It is believed that lemon juice makes the meat more juicy and tender that is why in recent years have increased the popularity of the mayonnaise with lemon juice to prepare mixture for marinating kebabs. Many modern manufacturers offer customers various kinds of mayonnaise with lemon juice. For marinating meat, you can choose products from any manufacturer, not just a mark on the lemon juice. Mayonnaise is mixed thoroughly with chopped onions and garlic. To taste add salt and required amount of black pepper. The marinade for the pork is ready. Pork you need to prepare, thoroughly rinse the meat and dry for a few minutes. You can use napkins or paper towels. Cut pork in small cubes better. The meat is then laid in a dish filled with marinade. In a mixture of mayonnaise, onions and spices pork must remain at least forty minutes. To meat soak in the marinade, thoroughly mix the pork slices in the marinade. After the exposure time of the meat in the marinade expired, pork ready for further cooking. 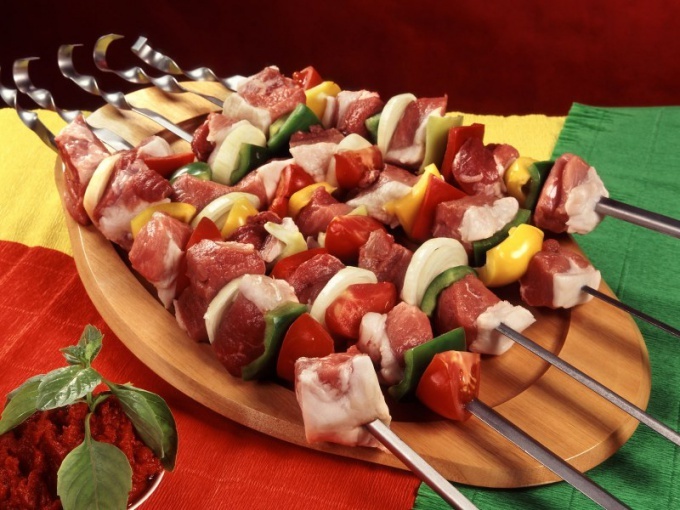 The pieces of meat strung on skewers, if desired, they can be alternated with onions or vegetables. The cooking times on the grill usually does not exceed 30 minutes. Tender pork marinated with mayonnaise with lemon juice will satisfy every lover of camping.